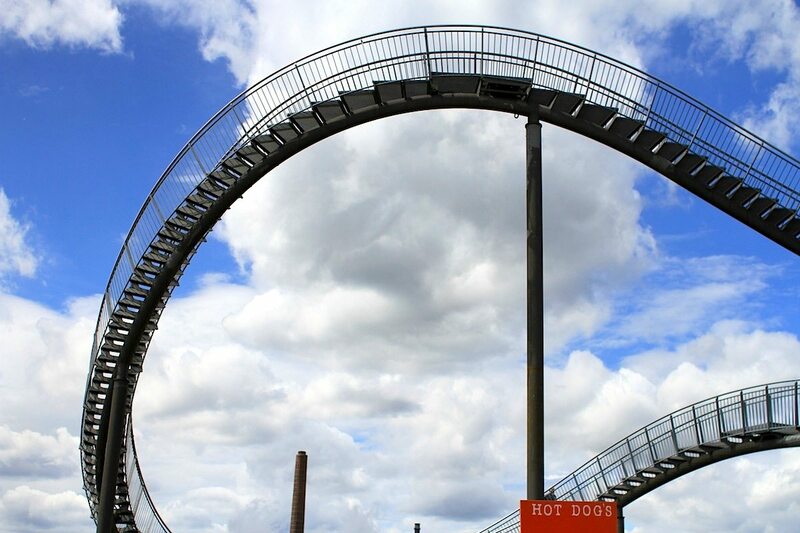 Panorama Planet - Bottrop, Deutschland - THE LINK – Stadt. Land. Architektur. 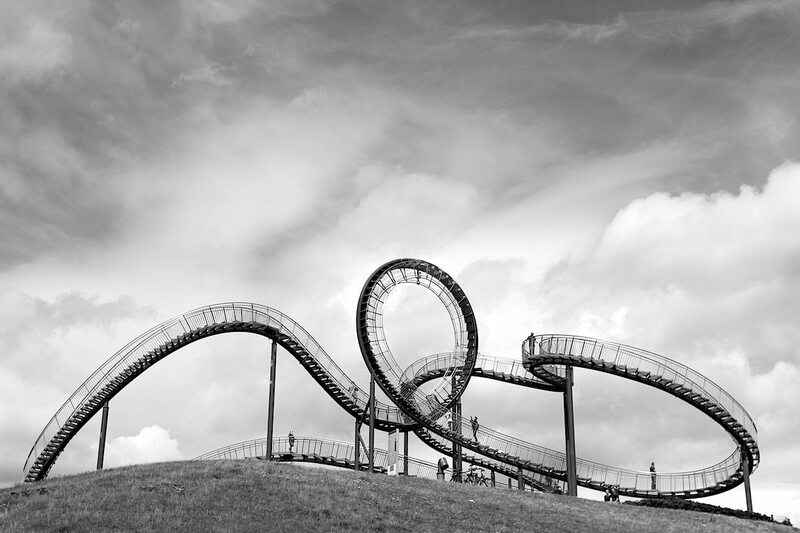 Bottrop. Duisburg. Essen. 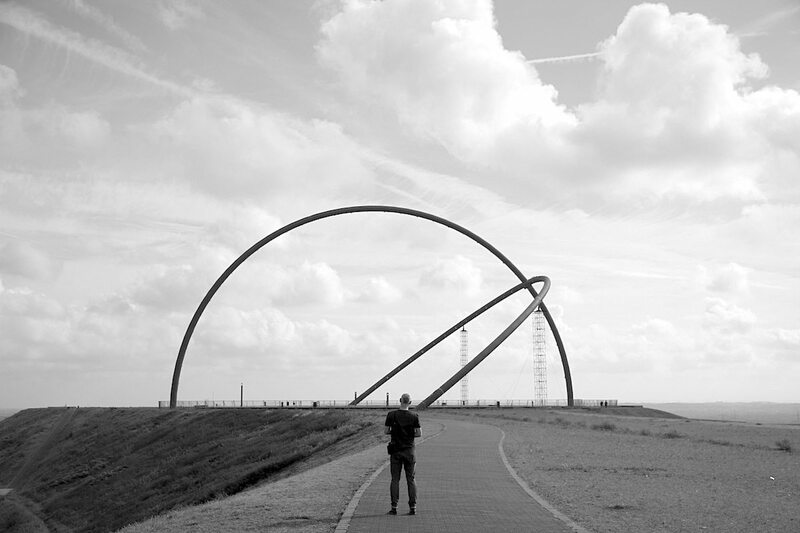 Herten. Neukirchen-Vluyn. Deutschland. Advertisement. 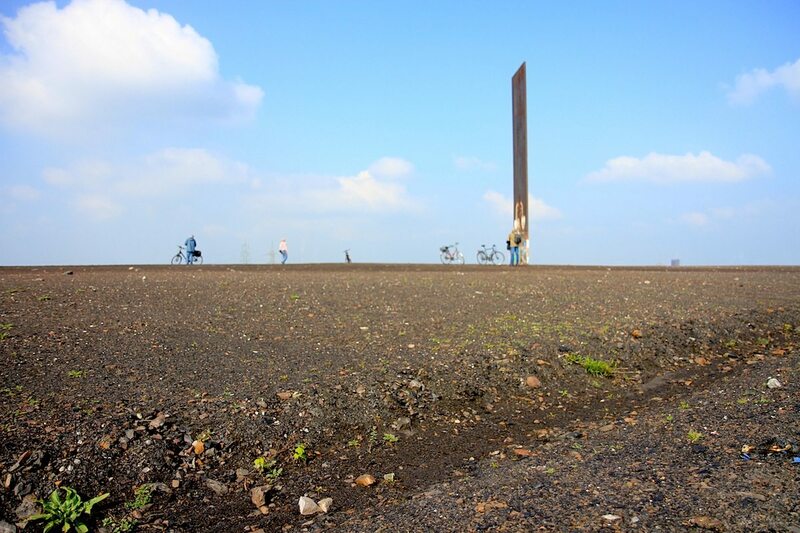 After Part 1, with the UNESCO World Heritage Site Zollverein Coal Mine, and Part 2, with industrial monuments, in this last part of our series on the Industrial Heritage Trail in the Ruhr Area we go up to the slag heaps, with their spectacular installations. The roaring of the A42 highway fades away the higher one goes on the Schurenbach Heaps. At the top: a loamy Morla landscape. 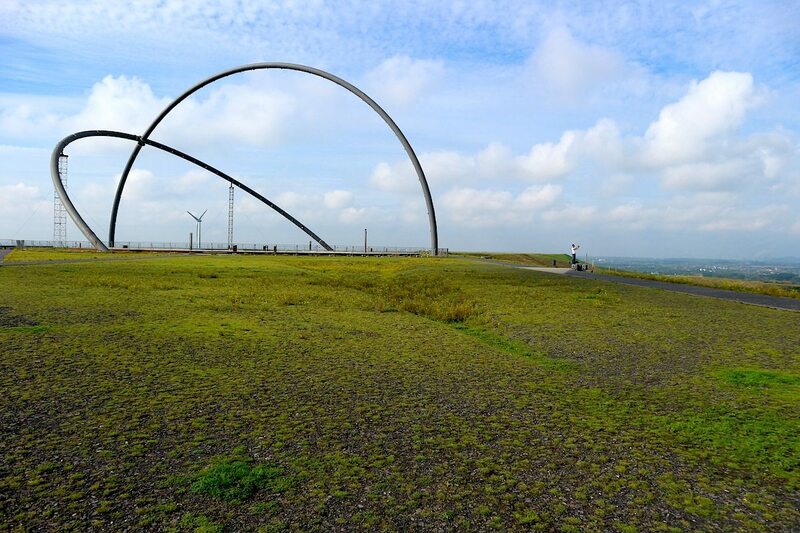 Like Morla, the ancient, giant tortoise from the novel The Neverending Story, by Michael Ende, this elliptical plateau swells high over the area. 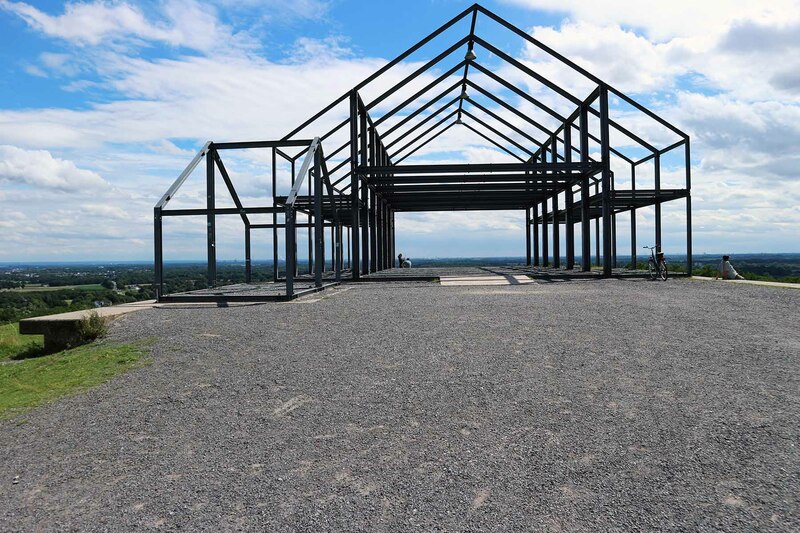 On the highest point of this turtle-world stands a slab, a rolled steel plate: 70 tons, 14.5 metres high, 4.2 metres wide and 13 centimetres thick. 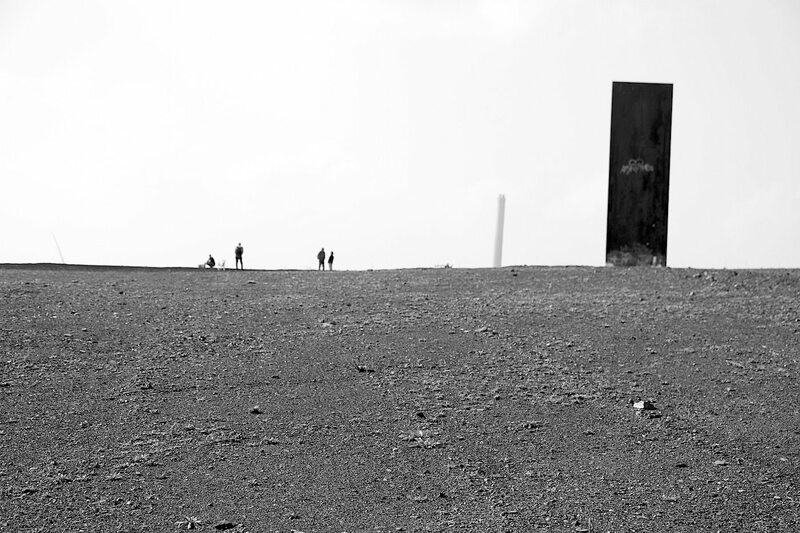 A slab for a wasteland, by one of the most important sculptors of our time: Richard Serra (born 1939 in San Francisco). 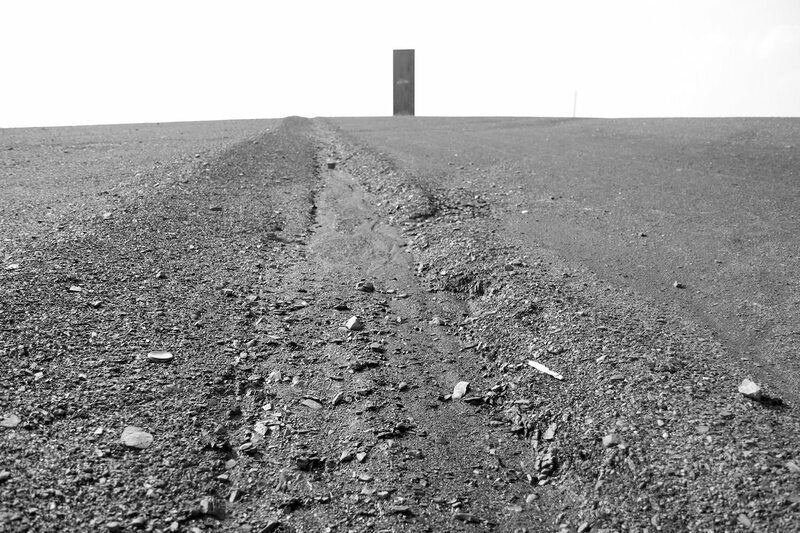 He aligned the steel plate exactly east-west along the wide sides. 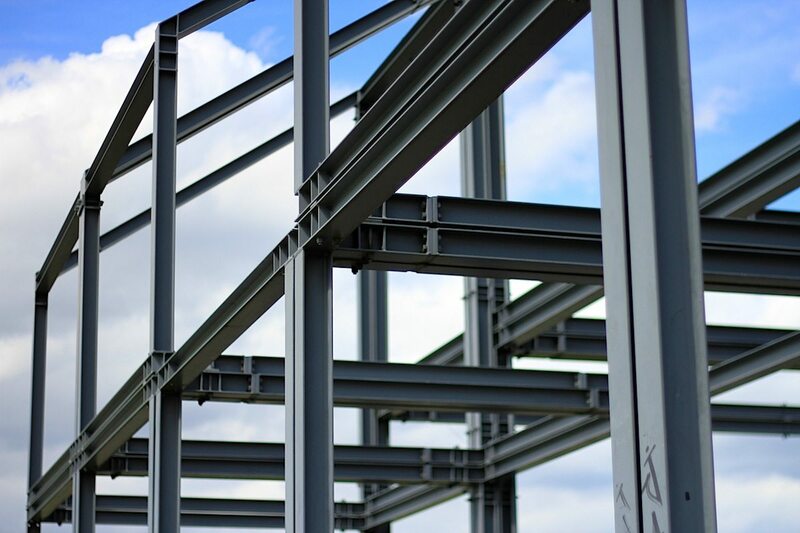 A slab is a block of poured steel, aluminium or copper, whose width and length amount to multiple times its thickness. 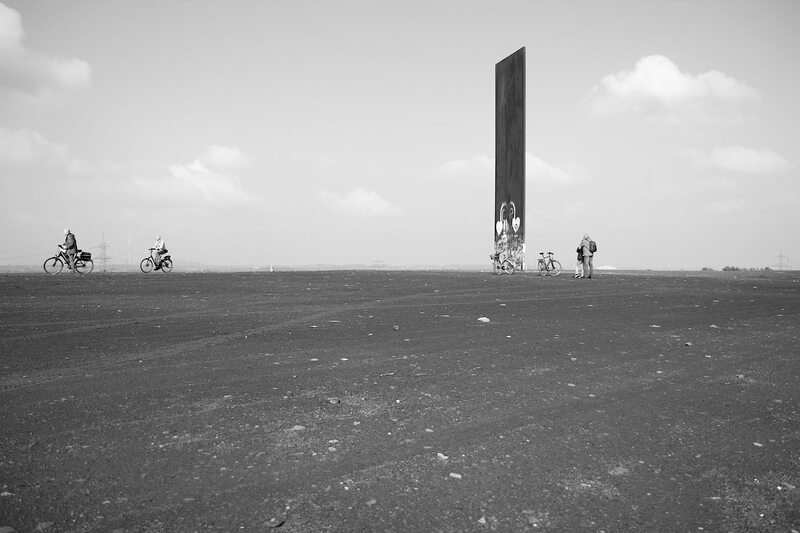 Its raw and massive form creates perfect sculptures. With or without Morla. Otherworldly meditation platform? 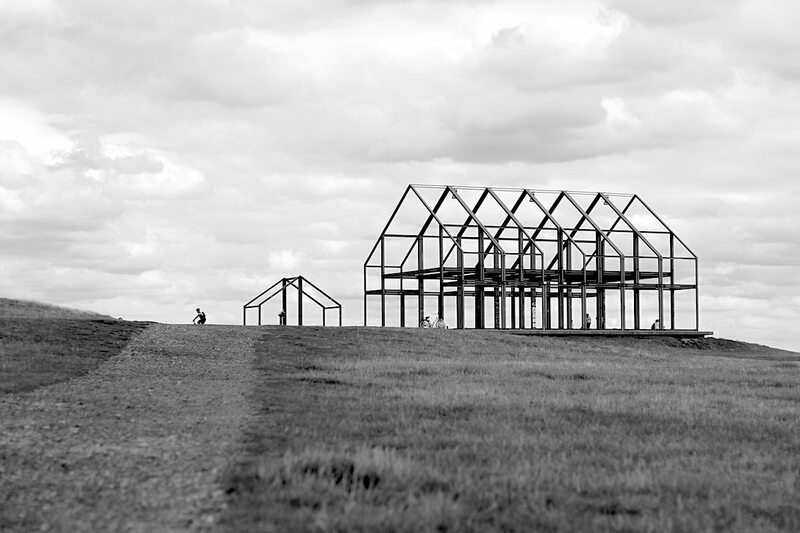 Parallel-world architecture? Both? 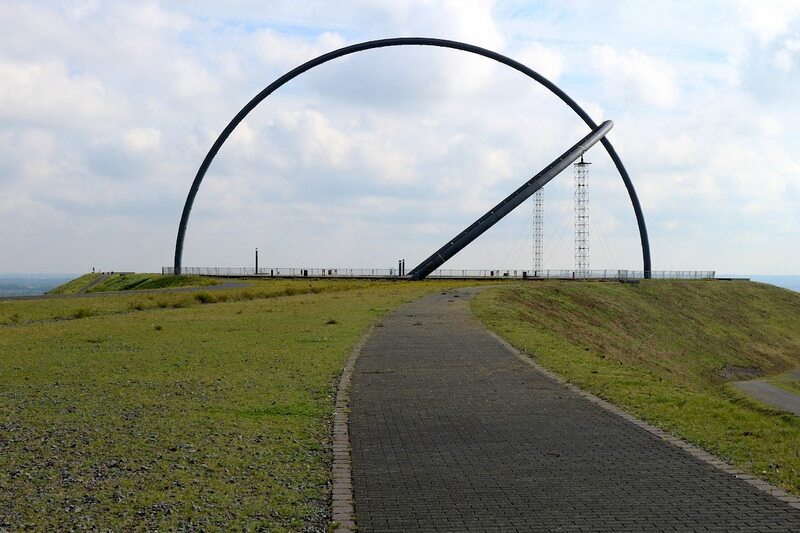 This landmark is almost two and a half decades old and has become both one of the most important attractions in Bottrop and a symbol for the reinvention of the Ruhr area. 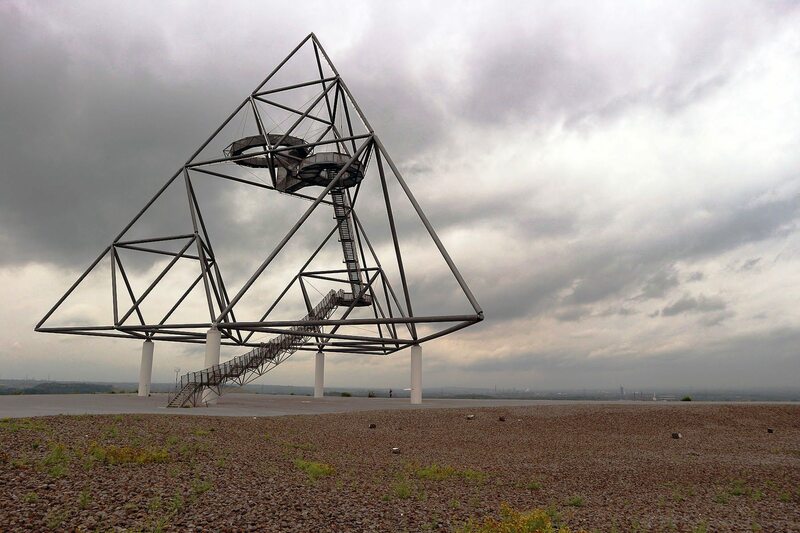 The Tetrahedron, designed by the architect Wolfgang Christ, consists of a steel framework in the form of a walk-in pyramid and a tetrahedron, a body with four triangular surfaces (from the Greek: tetra = four). 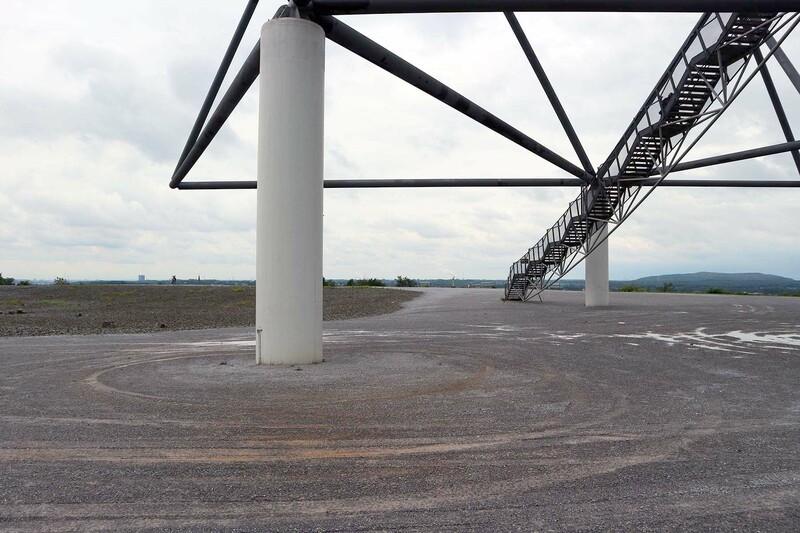 The 210-tonne steel framework, constructed on the peak of the heaps of Prosper Coal Mine, is 50 metres high and stands on four concrete pillars. 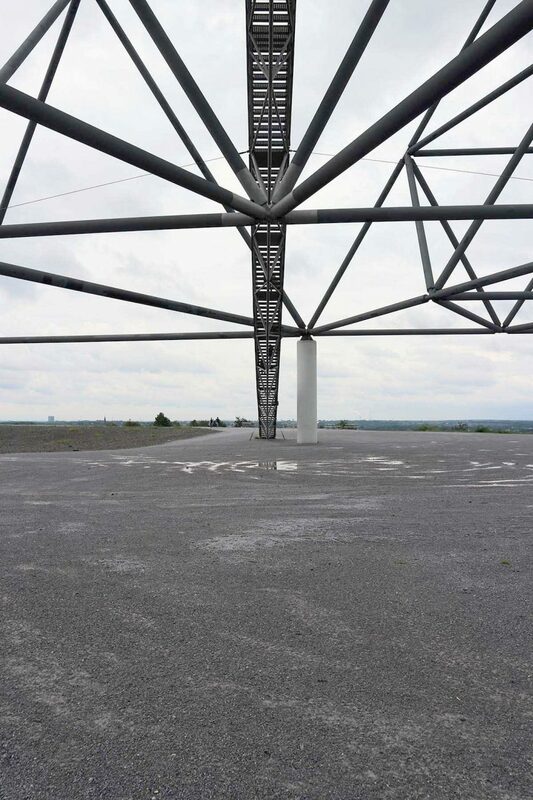 Officially, the tetrahedron is titled “Haldenereignis Emscherblick” (roughly, “Heap Event, View of Emscher”), and at its completion in 1994, it was part of the construction projects of the International Building Exhibition IBA Emscher Park. 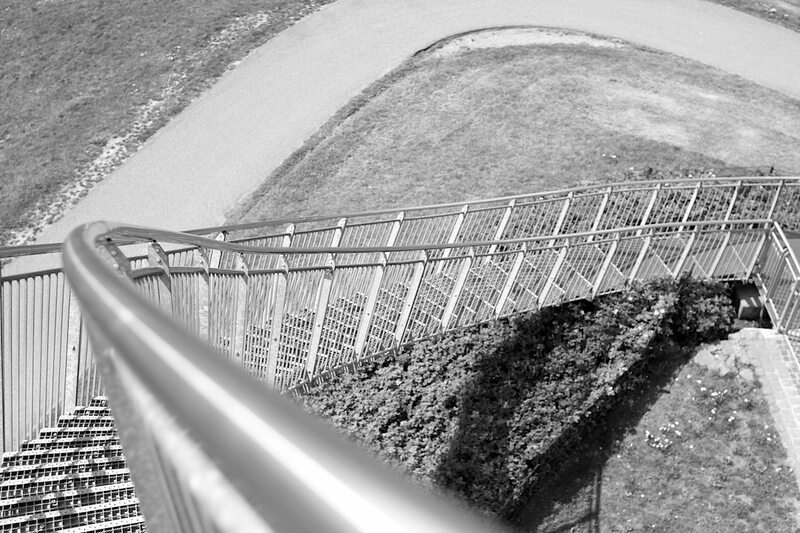 Curved steps lead to three viewing platforms. It sways steadily, according to the rush of visitors and wind conditions. 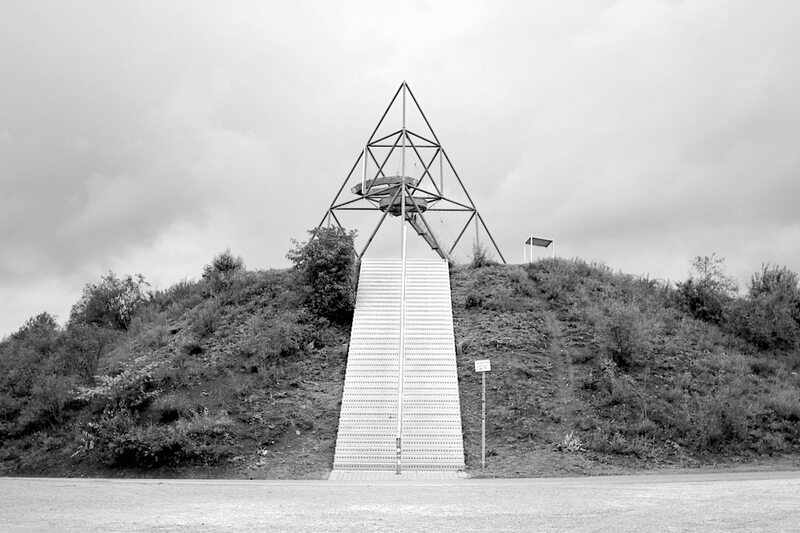 The tetrahedron occupies the surreal landscapes of the heaps like a signal from outer space: slender, ethereal, alien. 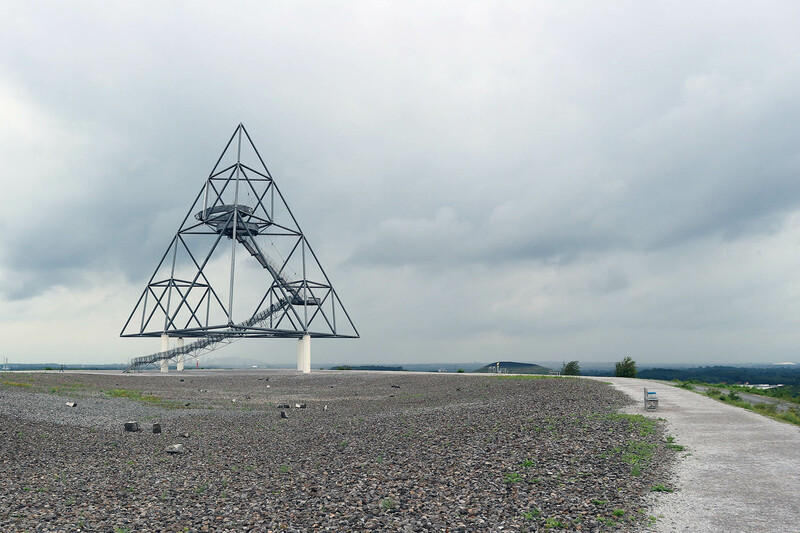 There is a parallel-world experience in these heaps in the Lower Rhine Area (called the Heaps of North Germany) as well. 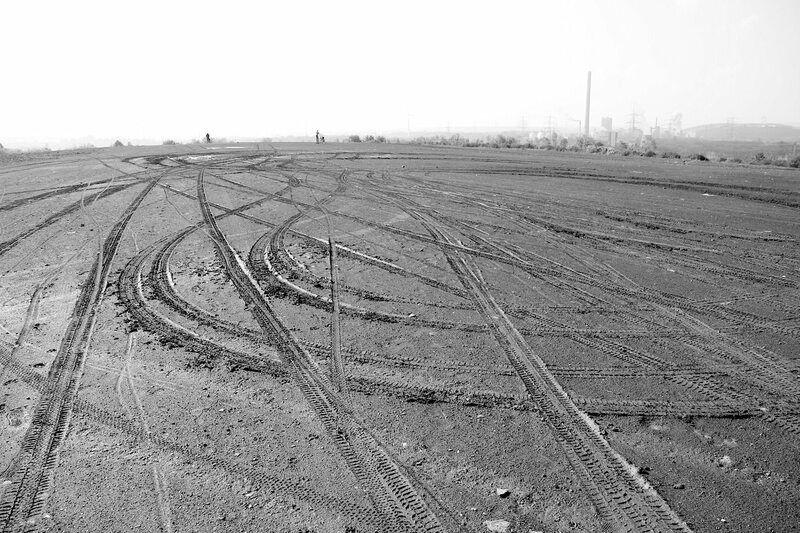 A sometimes-laborious, often-lengthy ascent is common to the panoramas of the industrial landscape. I want to hear your heavy breathing, moans the cruel heap, looking with satisfaction at the 359 steps of the “stairway to heaven” and the 102-metre height, forcing visitors to prove themselves. The result is always the same, or so I assume. At the top, one’s pulse is racing. Why? For absolute rapture. 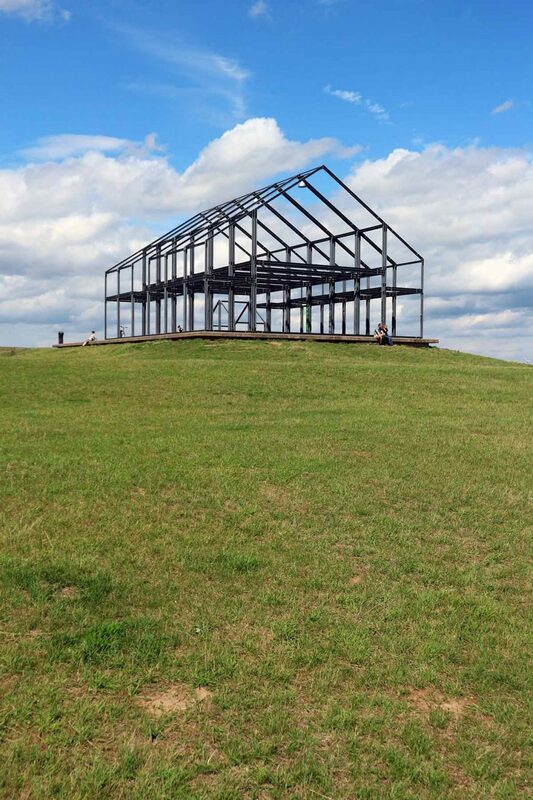 And because, with just a few, targeted interventions, it has become an artistic landmark (a conceptual “Mountain of Stillness” by the landscape architects WES + Partner), it doesn’t fail in its effect. 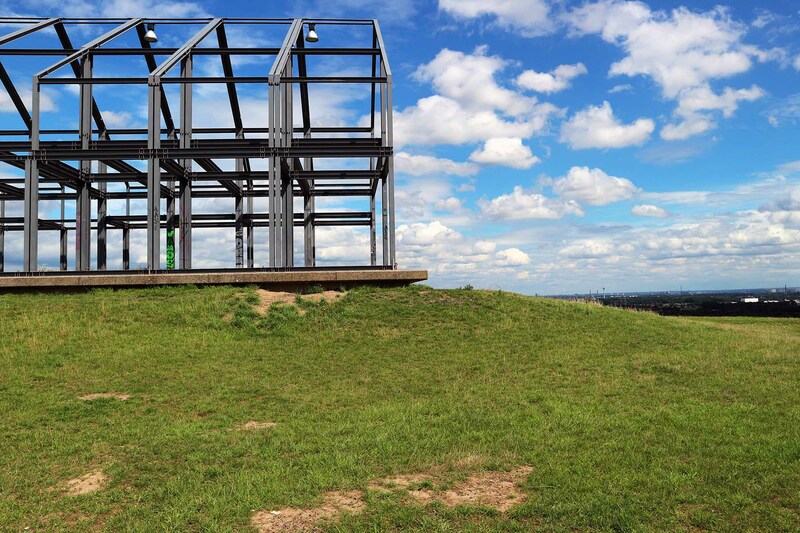 One of the landmarks on it is the artwork “Hallenhaus”, a farmhouse erected as a steel framework. 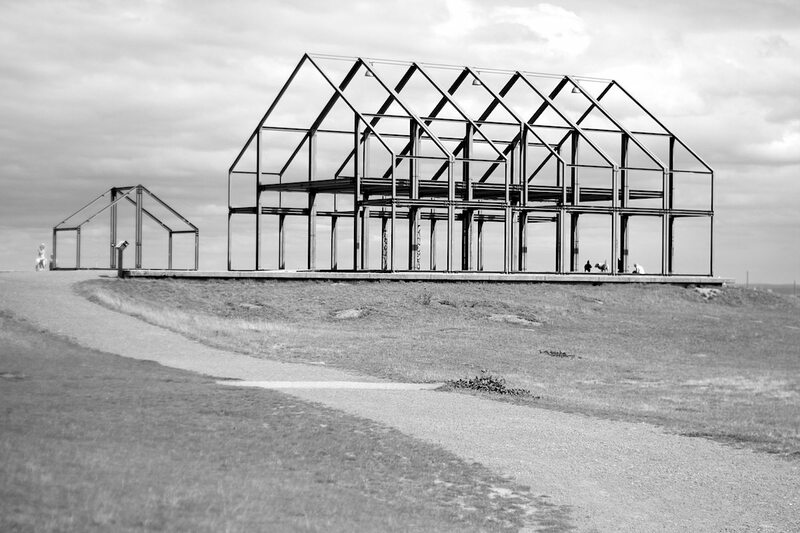 It was built in an exposed position and consists of modules of differently formed steel frames. 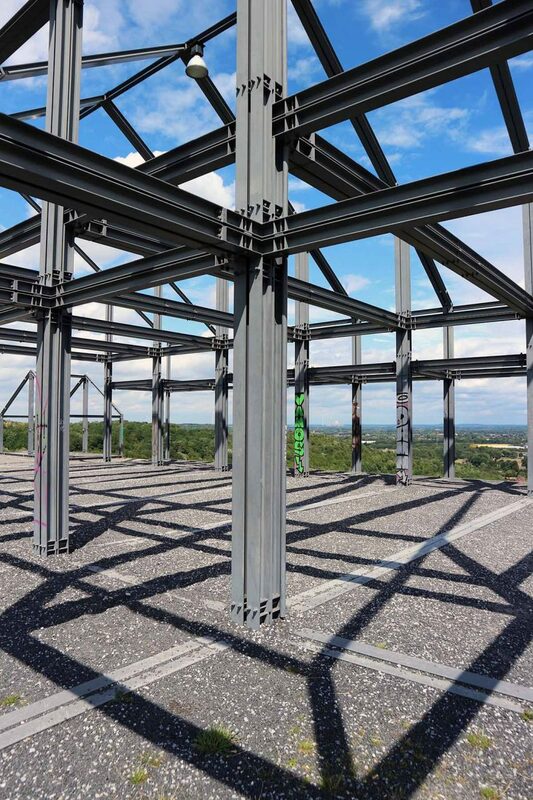 The steel skeleton rests on a pedestal, thus looking like the foundations of an ancient temple site. 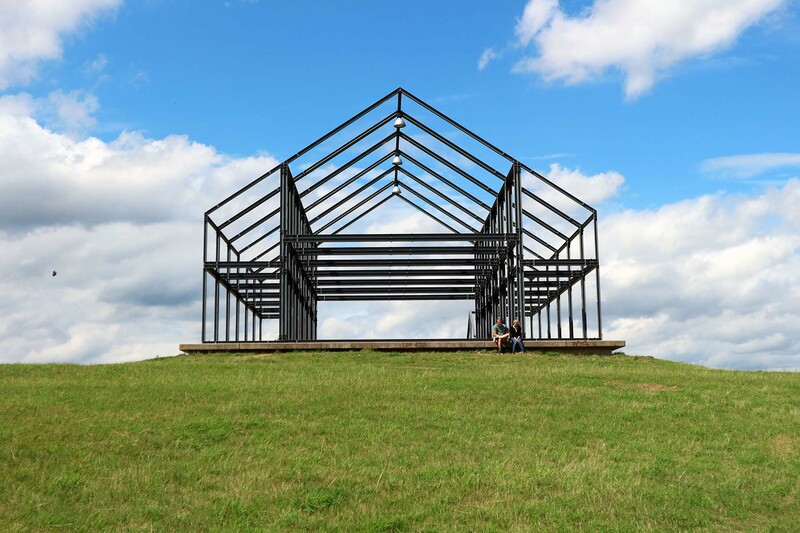 WES + Partner worked together with the Dutch artist- and architect group Observatorium, which sees itself as a crosser of the borders between architecture and art, and has realised many projects and landmarks worldwide. 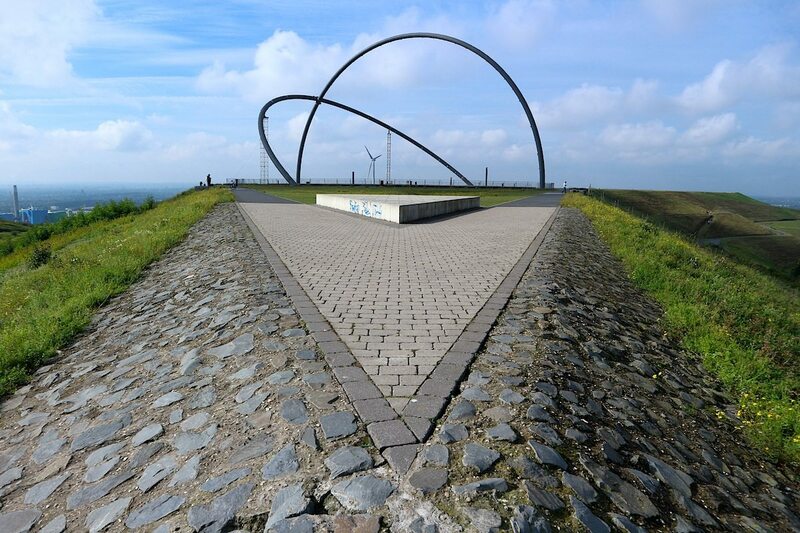 Halde Norddeutschland is definitely worth a border crossing. On this site on Ehinger Straße, there is a discount shop, the Krupp Mannesmann smelting works and plenty of 1980s sports cars in front of 1980s houses. 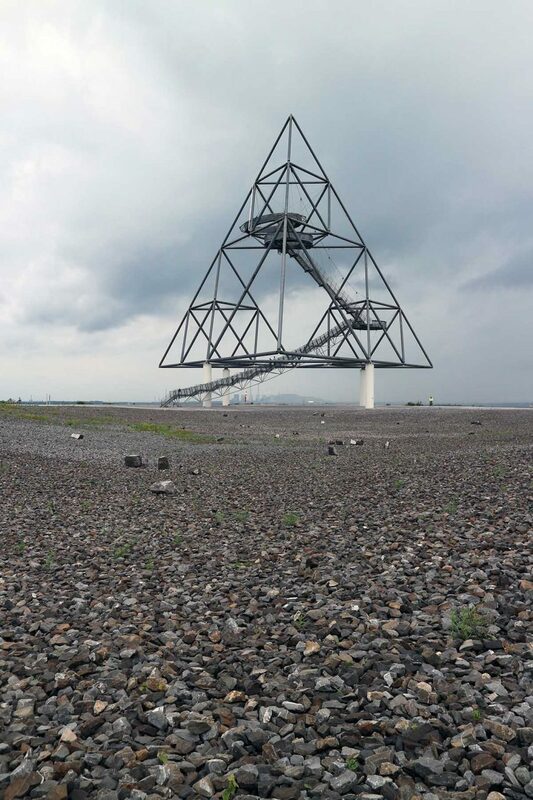 Normally, this would be an unusual area for a one of the Ruhr’s most spectacular landmarks. 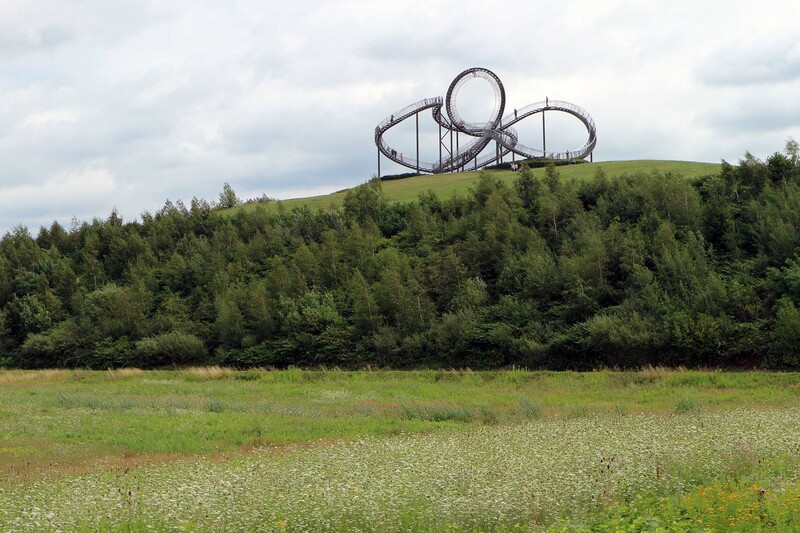 The large-scale sculpture, which recreates a set of stairs as a roller coaster on the Heinrich Hildebrand hill, is an artwork by Heike Mutter and Ulrich Genth that was developed in the context of the Ruhr.2010 cultural capital. 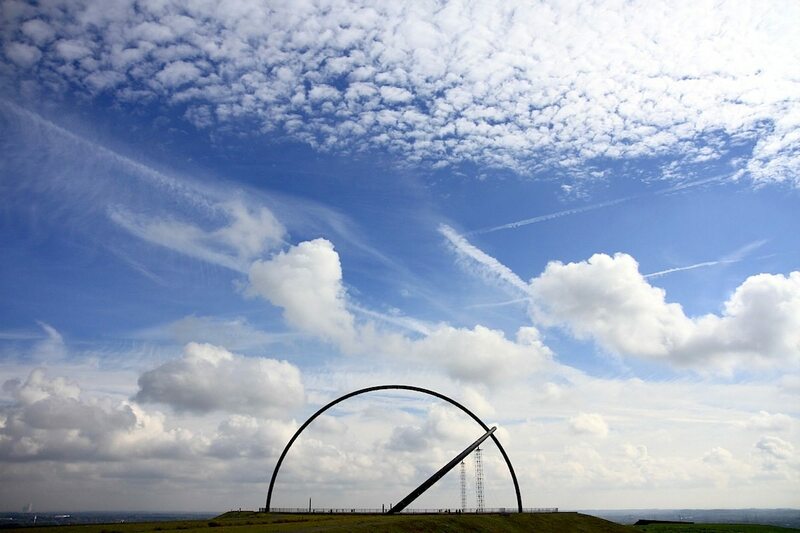 It stands on a 33 metre high, green-planted, former industrial slag heap. 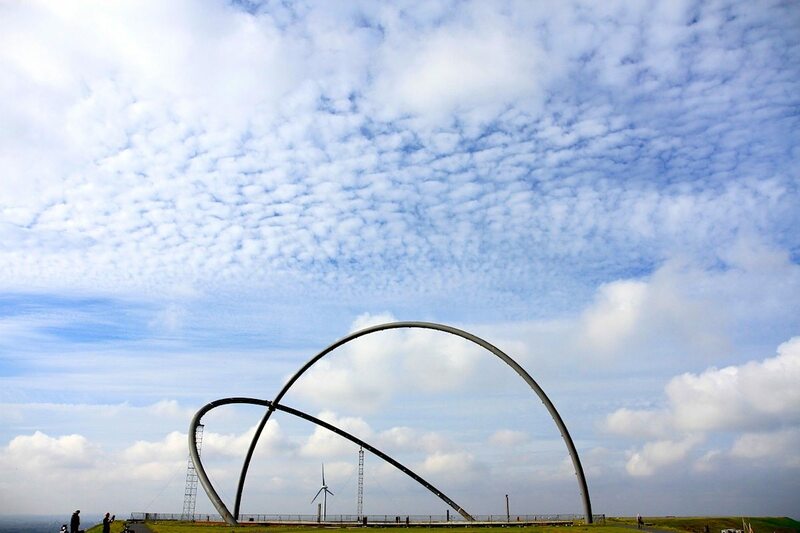 Visitors can take a closer look at the curves and steps of the 21 metre high outdoor sculpture of galvanised steel up until it starts looping. 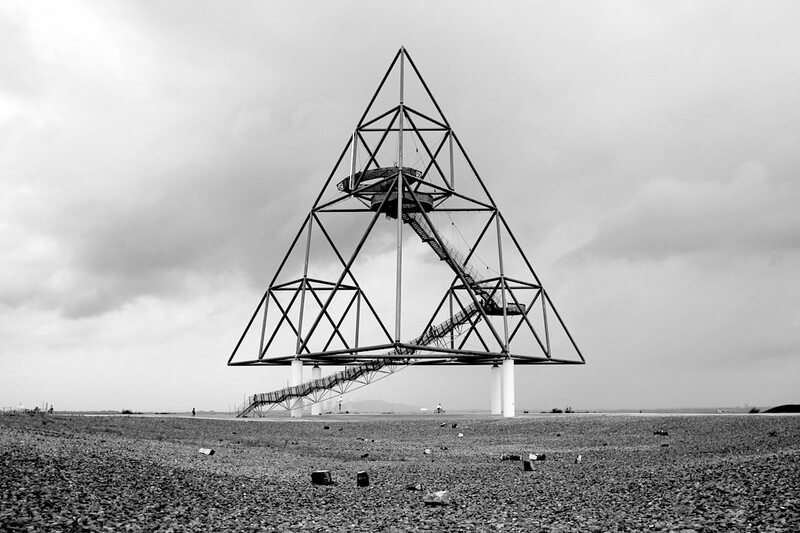 Just like the Tetrahedron, this Magic Mountain is a social media experience. 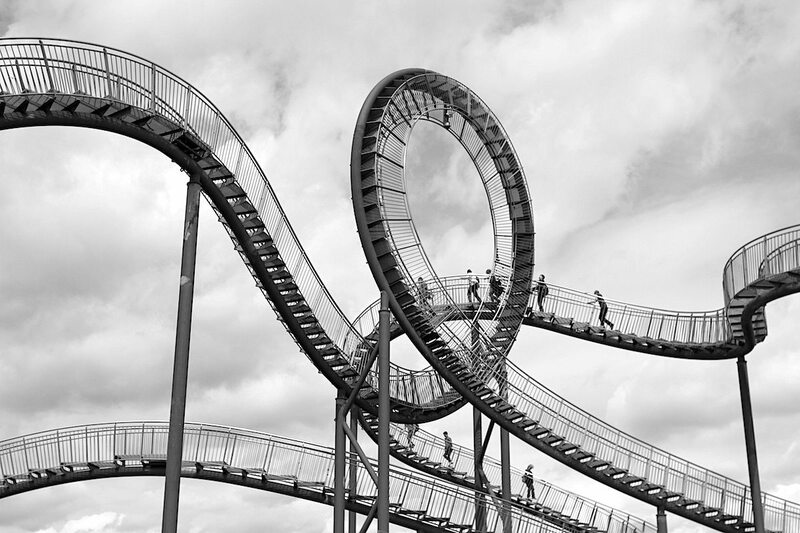 Both appear on Instagram, Pinterest, Flickr and other media tens of thousands of times – each record as different as the perspectives that the curved work allows. 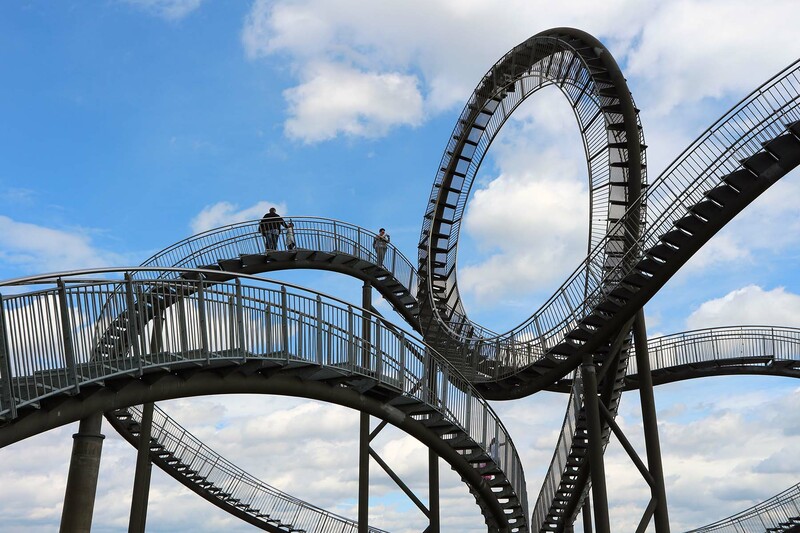 What’s more, the artist duo understands the staircase rollercoaster as a criticism of our consumer society and as a commentary for the structural change of the Ruhr area: a tiger that is being made into a tortoise. Or is it rather the other way around? 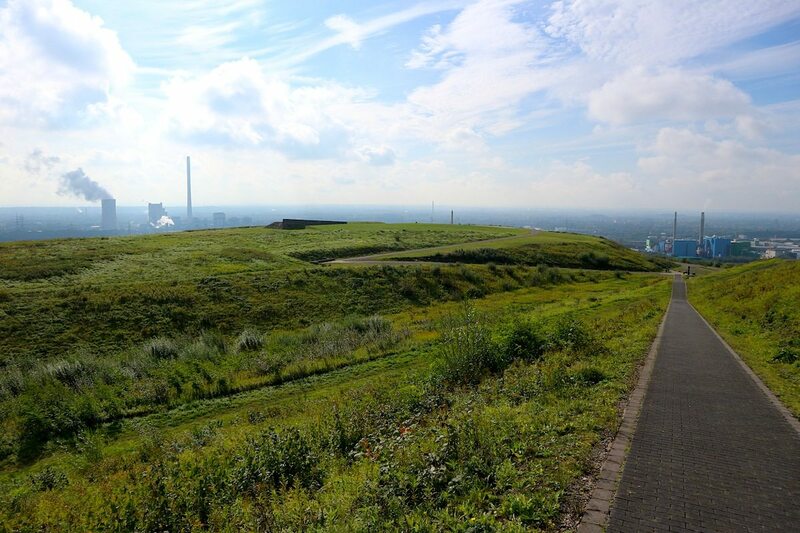 At 150 metres tall, with a surface area of 170 hectares, Hoheward is one of the largest slag heaps. 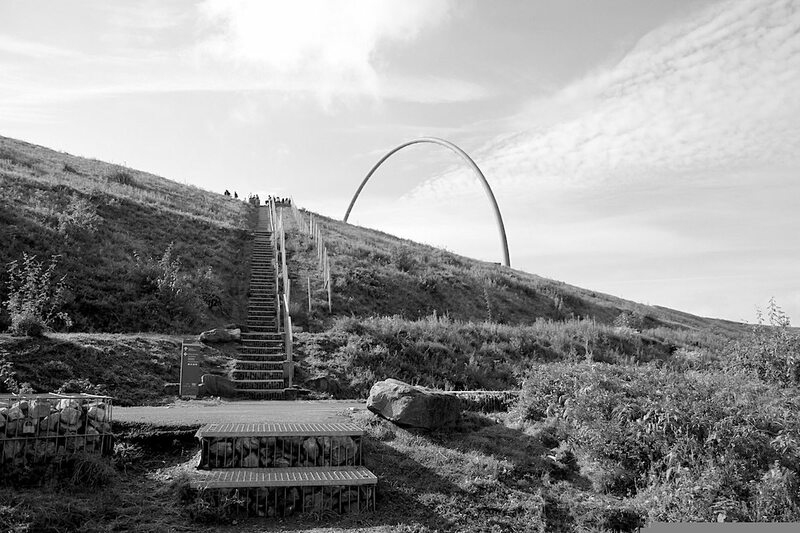 Together with the Hoppenbruch heaps, it is the largest heap landscape of the Route of Industrial Culture. 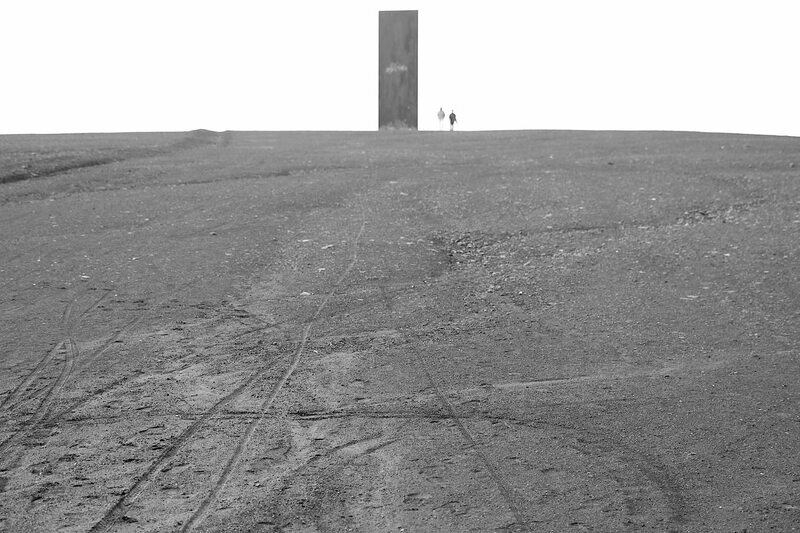 Defining landmarks include the 45 metre high, steel Horizon Observatory and the horizontal sundial with the obelisk. 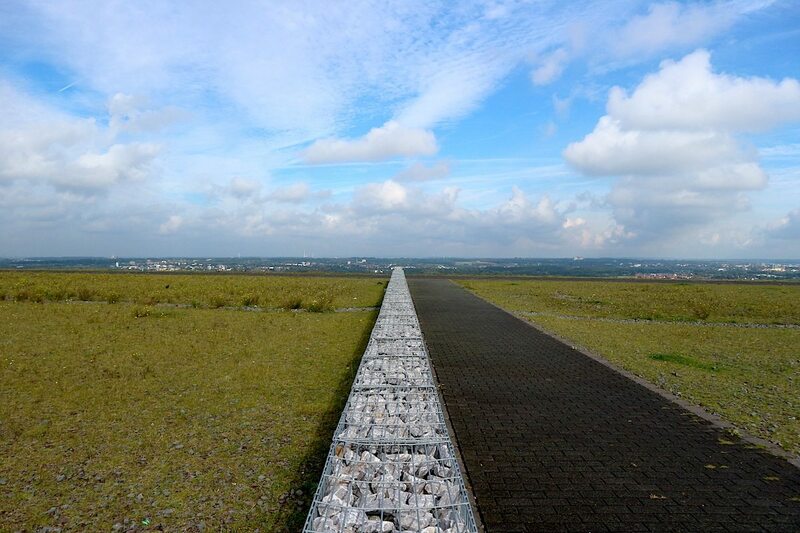 The Dorsten office of FL Freese Landschaftsarchitektur was commissioned by the Ruhr regional association (RVR) and the cities of Herten and Recklingausen to plan this large project (planning idea: Agence Ter, Prof. Henri Bava, Paris, Karlsruhe). Along with the special buildings, it included supports, paths, levels, ramps and staircases. 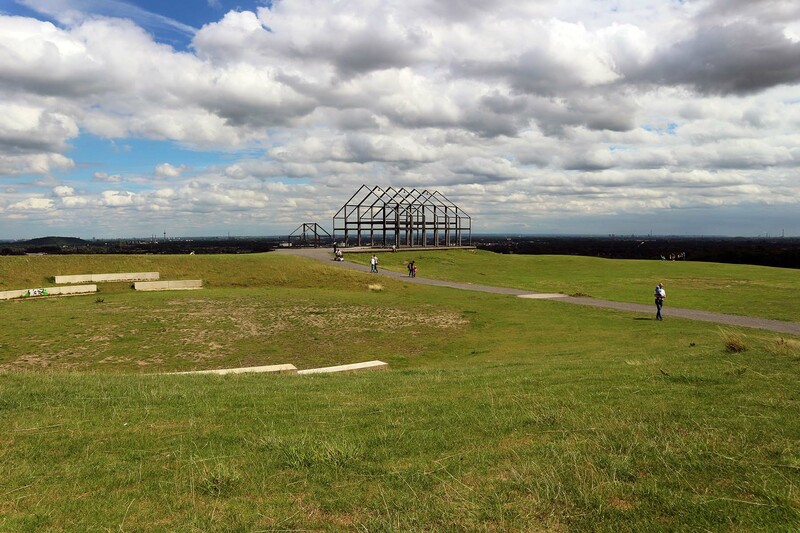 In spite of a lengthy dispute about the area of the observatory, closed since 2009 because of defects and breakage, Hoheward has developed into one of the most beloved landscape parks. 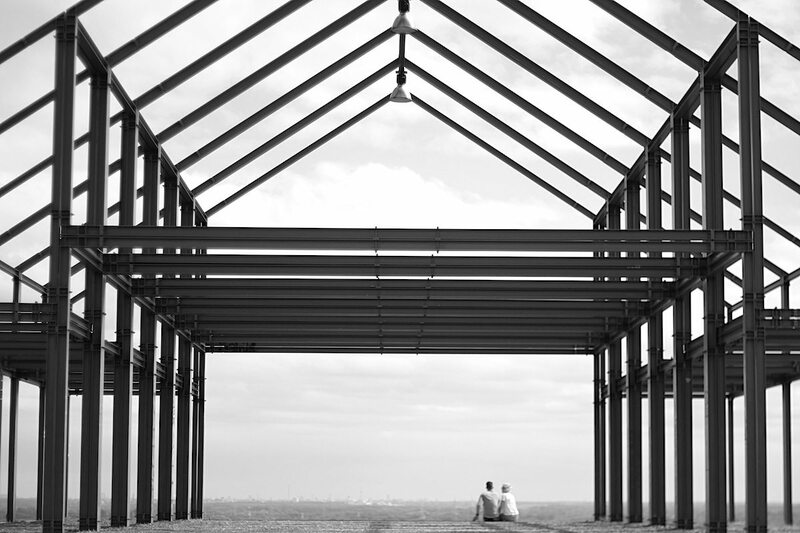 Not excluding the typical heap atmosphere, either; we enjoyed rapturous peace and wide views. Though, admittedly, we were there on weekdays and in the morning. 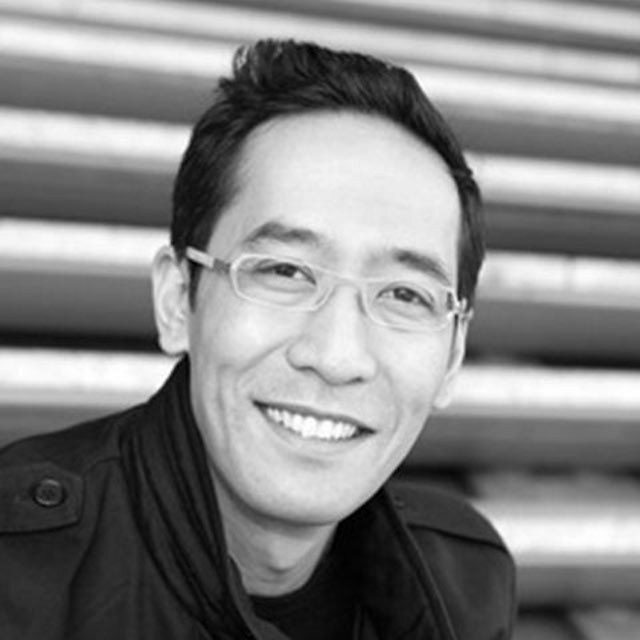 Von Jan Dimog Publizist und Gründer, veröffentlicht am 15. November 2017 .